Responsible partners from gea 21: Isabela Velázquez, Carlos Verdaguer. 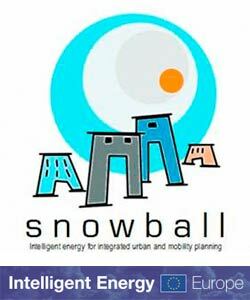 The Snowball project is presented by a group of European cities and experts on urban planning. The project is subsidized by the European Commission in the STEER programme. The project is motivated by recent experiences based on demonstration and research (Ecocity), that show that integrated urban planning will lead to plans of better quality, in terms of energy savings and the environment. In order to achieve better quality, Snowball introduces two types of integrated urban planning methods: Local Transport Performance, an area-based approach that reduces energy intensive transport demand, and Drive Slow Go Faster, a corridor based method that improves energy efficiency of traffic by establishing constant reduced speeds. In the project, six cities (Verona, San Sebastian-Donostia, San Fernando, Zvolen, Martin and Ludwigsburg) will implement plans following these concepts. The cities are supported by three other cities (Hilversum, Stockholm, Trnava) that implemented similar plans earlier. 1. Provide municipalities with experiences and tools to sustainably (re)create urban areas or corridors. 2. Implement integrated urban planning methods in the six partner cities. 3. Disseminate the evaluated project knowledge to other European cities. 4. Reduce the demand for transport, facilitate a modal shift and significantly reduceenergy consumption, emissions, noise and traffic accidents. 5. Add value to previous EC actions: Ecocity, CIVITAS, Cities of Tomorrow.